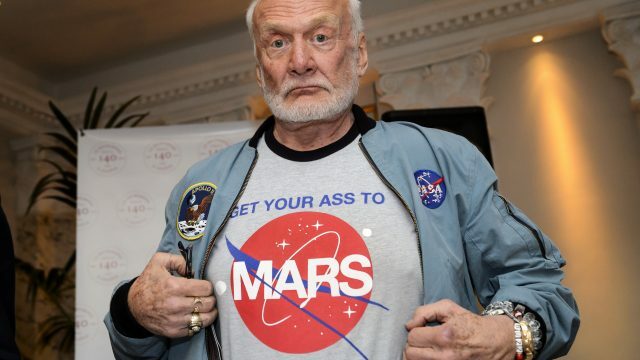 It’s fair to say that the world-famous silver medallist, Trump doubter and moon-landing truther puncher Buzz Aldrin has seen a lot of things that we haven’t. He, after all, has been to the moon. Or so he claims. Top of that particular bucket list is the existence of aliens, and according to The Sun he has proved it. Now, contact between man and extraterrestrial life has long been a powerful motivator of curiosity. It has launched film careers, space programs and the hopes of all that we’re very much not alone. It’s just a shame that that life other than ours may have been confirmed in the same manner as a debated paternity issue on Maury Povich. According to The Sun, Apollo astronauts Al Worden, Edgar Mitchell, Gordon Cooper and the titular Buzz all travelled to the Institute of BioAcoustic Biology Ohio to undertake the tests, which apparently indicated they were telling all the truthies. Now, the polygraph test has long been a questionable method of gaining the truth, long dismissed in the courts of law, but in the quest of space lore, apparently it’s all good. According to the Daily Star Aldrin passed the test on a more advanced version of the usual lie detector tests. Which, ironically, could be a lie. Pilot of the Apollo 15, Al Worden claimed that he also saw UFOs up there, with Apollo 14’s Edgar Mitchell echoing same point, with Gordon Cooper of the earlier Mercury/Gemini flights attesting that he attempted to pursue aforementioned peculiar objects, because alpha. Now, I’m not saying that it isn’t true, or that they’re all telling porkies, but what isn’t being reported in the cosmic ballet of headlines this morning is when the actual tests were undertaken. As Mitchell passed away in 2016 and Gordon Cooper shuffled loose the mortal coil twelve years previous, it obviously hints at the study was undertaken with a live Buzz, with the institute measuring the timbre of dead space men through audio recording. Taking into considering the rule of space thumb, where every piece of news that hints at anything mysterious in space must possess an equally insane conspiracy counterpoint, I’m willing to speculate that either they’re lying (you too, Buzz) or that the murky institute has reanimated the dead on behalf of the Trump administration to reignite the public’s interest in space travel. Because, of course, interest leads to programs, which leads to money, which means that we can finally beat the Russians to the moon. For realsies this time.